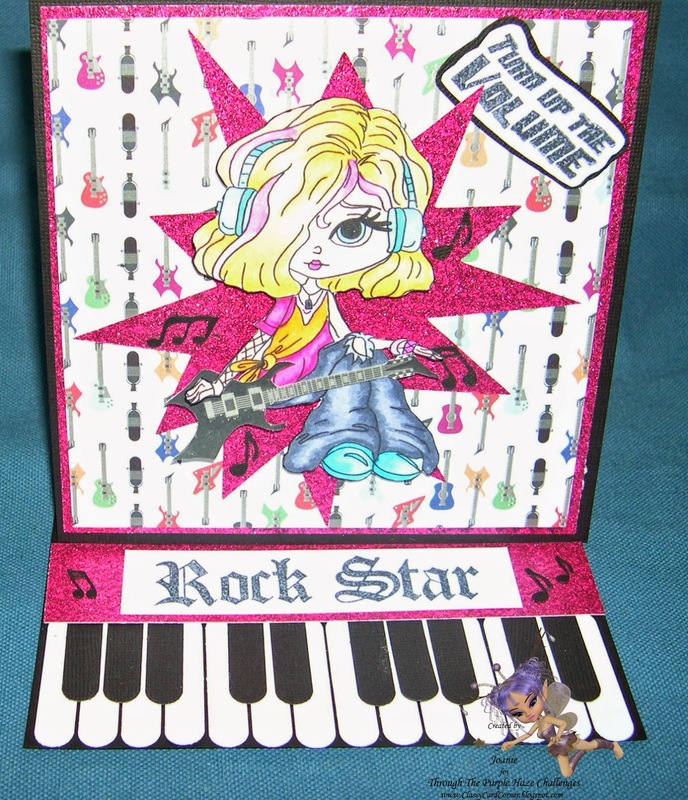 Joanie's Classy Card Corner: Let's Rock ! ! ! Hi my scrappy friends old and new, if you're new here, welcome aboard and feel free to browse around. To start off with, let me say this...... the following is a sketch!! LOL You are probably thinking what's with this crazy lady, I know that's a sketch!! I used some Hot Pink Glitter paper on top of a solid black card stock and then added the Guitar patterned paper from Twinkle, Twinkle Little Star, Wonder Years. Then I punched out the piano keys with a Stampin' Up Punch... Little Window Word Punch. I cut out the music notes as well as the Hot Pink Star Burst on my Zing Cutter. I fussy cut the guitar and then coated it with Diamond Glaze to give the guitar base a really classy shine... just hard to photograph. Then I stamped the sentiment Turn Up the Volume and Rock Star from Stampabilities. I love the image, Jillian Jammin from Lacy Sunshine.... oh, how I love her digis... sooooo cute and I colored her with my Copic Markers. You have to go look around the Lacy Sunshine Shop..... Whew!! this is a shoppe... and there is a magazine available now too!! Just go and see for yourself... unbelievable!!! Downright Awesome!!! Here is some great news..... create your card and join our Through the Purple Haze Challenge and you could be the winner of some free digis from Lacy Sunshine. That is one great prize!! So get to Scrappin' to make it Happin' !! Oh, there is a sketch to follow.... LOL! !